Pioneering urban farmer and MacArthur “Genius Award” winner Will Allen had no intention of ever becoming a farmer. But after years in professional basketball and as an executive for Kentucky Fried Chicken and Procter & Gamble, Allen cashed in his retirement fund for a two-acre plot a half mile away from Milwaukee’s largest public housing project. The area was a food desert with only convenience stores and fast-food restaurants to serve the needs of local residents. In the face of financial challenges and daunting odds, Allen built the country’s preeminent urban farm – a food and educational center that now produces enough vegetables and fish year-round to feed thousands of people. Employing young people from the neighboring housing project and community, Growing Power has sought to prove that local food systems can help troubled youths, dismantle racism, create jobs, bring urban and rural communities closer together, and improve public health. Today, Allen’s organization helps develop community food systems across the country. 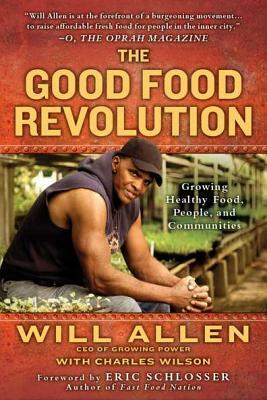 An eco-classic in the making, The Good Food Revolution (Gotham, $26) is the story of Will’s personal journey, the lives he has touched, and a grassroots movement that is changing the way our nation eats. Presented by Books & Books in collaboration with Slow Food Miami.